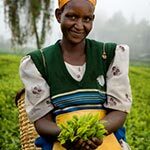 Buying Fairtrade can help improve wages and puts investment into tea-growing communities. Nothing like a cup of tea to kick-start your day. But there’s just not enough going back to the millions of farmers and workers who depend on tea for a living. In 2012 over €4.5m in Fairtrade Premium was paid to smallholders and workers on Fairtrade-certified estates – money that was used to improve living and working conditions. Fairtrade standards for plantations also help to regulate wages, health and safety standards and prevent child and forced labour.And Fairtrade is part of the Ethical Tea Partnership which is working to make the long term future of the tea industry sustainable, so you never have to go without your daily cuppa. Sireet Outgrowers Empowerment Project Company Ltd (Sireet OEP) is an organisation of small-scale tea growers who also own a tea factory.